Tap into their friends. When you're driving a group of kids to a game or camp, ask them what were some good books or series they liked. Your own child will groan, but other kids will chime in. Experiment with digital reading - the novelty might appeal to your child. See if your public library lends digital books for kids - more & more are expanding their holdings, and it's getting easier and easier to download books from the library. Try audiobooks. Yes, this counts as reading, too! Offer audiobooks on a long drive or at home. My older kids love listening to books and playing a repetitive game like FlowFree or Subway Surfer. Even better: listen and draw. Think outside the box. Would your child like a new magazine? Do they want to learn about a favorite sport or how to build something? Can you encourage them to research activities to do during the summer - places they want to go, things they want to do? Insist on reading time. Stick to your resolve. Make sure you carve out time each day for reading. It doesn't have to be at night, but often this is a good way for kids to wind down after a busy day. Whenever you do it, remember that it's important you insist on time for reading. Below are summer reading lists I developed for our school community. This week I'll share all our elementary reading lists. Below, you can download the lists for kids who've just finished 4th & 5th grade. Please feel free to download these, print them and share with your friends. 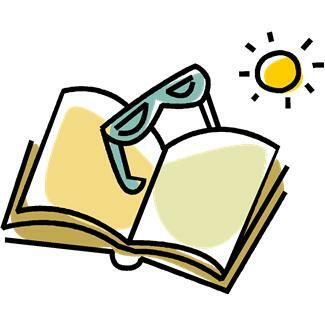 Most of all, try to make summer reading time a fun, relaxing part of your summer! Kids who've finished 2nd & 3rd grades often love reading series, but sometimes have trouble figuring out what series to try next. It's crucial that kids read lots of "just right" books, or even ones that seem a bit easy. As a parent, I know that it's hard not to encourage my kids to try harder, longer books. But it's really important for kids to sink into reading, to feel success and enjoyment. Think of it this way - your kid will get more out of reading 10 fun, easier books than giving up on a challenging classic that's way above his reading level. Here are our summer reading suggestions for kids who've just finished 2nd and 3rd grade. I've organized them using the Fountas and Pinnell reading levels, which our school uses. I find it most helpful to think of these levels in "bands" of similar levels. As I talk with kids, I really try to get them to think about whether a book feels right to them. This places them in charge of their reading choices, and tells them that I trust them to choose what's best for them. Please feel free to download these reading lists, print them and share with your friends. 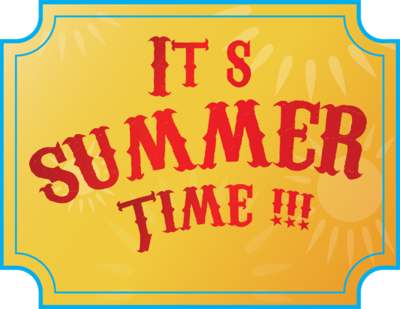 Summer has started and I know my kids are loving the freedom from our regular school routine. But I also know that it's essential that they stay engaged with reading throughout the summer. Kids who don't read over the summer will lose up to two months of reading growth - see this Reading Rockets article for more details on the research. Try to go to the library after work together or on a weekend. Look online and request your favorite books from your library. Explore websites for places you want to visit. Let your child navigate while you guide. Talk with your kids about their reading - share the fun, excitement - read together! Use books to break the boredom! Try to break the habit of always turning to electronics for entertainment. Below are summer reading lists I developed for our school community. This week I'll share all our elementary reading lists. Below, you can download the lists for kids who've just finished Kindergarten & 1st grade. Please feel free to download these, print them and share with your friends. Children's stories permeate our culture. Whether it's Disney films, Broadway musicals or even public television, characters from children's stories sink deep into our cultural heritage. This is nothing new -- the Brothers Grimm recorded fairy tales that had been passed down generation to generation; these same tales still enchant us centuries later. But lately I've been wondering what the heroes from children's literature say about our times. 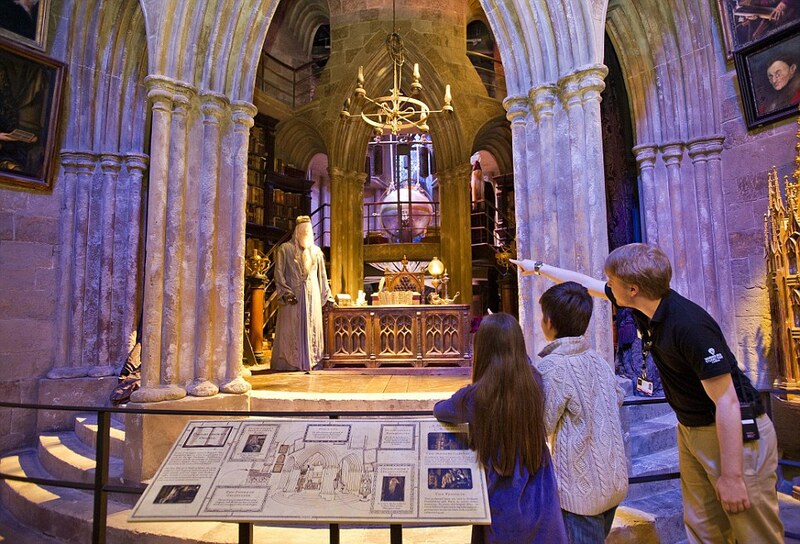 This week, we've seen two fantastic musicals based on Roald Dahl's stories, Matilda and Charlie and the Chocolate Factory, and visited the Harry Potter studios outside of London. Last month, my youngest was in a musical based on Disney's version of Alice in Wonderland. Our whole family was captivated by these productions. The musical productions amazed us for the sheer talent the young performers showed. I loved the way that the musical numbers brought the joy and heart of these stories to new audiences. But I think there's something at the heart of each of these stories that speaks to the generation they came from. All of these heroes are lonely children, a protagonist that kids today still relate to. They face trials and tribulations, whether it's the dreadful Queen of Hearts or the terrifying Miss Trunchbull. A common theme is certainly that children have to bravely fight injustice and tyrannical adults. But each of these heroes overcome their challenges in different ways, and I'm fascinated by these journeys. "Unabashedly inquisitive, she’s not afraid to stamp her foot and demand rational responses from authority figures. And when she doesn’t get them, she doesn’t quiet down." I've always been a bit perplexed by how Alice eventually faces down the Queen and makes her way back to her regular life. The whimsy of Carroll's wacky world has always struck me as a bit too happenstance and random. 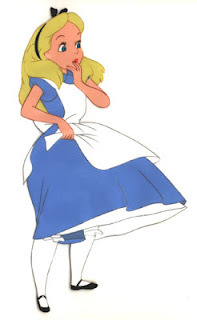 Alice would never find her way through Wonderland if it weren't for the White Rabbit guiding her way. 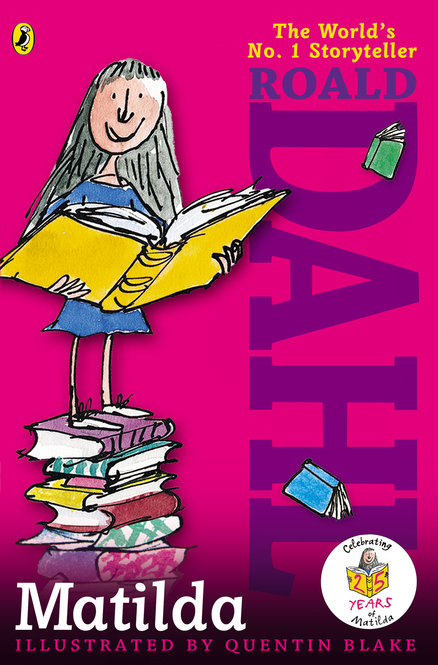 Roald Dahl's heroes succeed through sheer will, positive spirit and determination. Matilda, with music by Tim Minchin, emphasizes that you have to stand up to tyrannical authority figures. 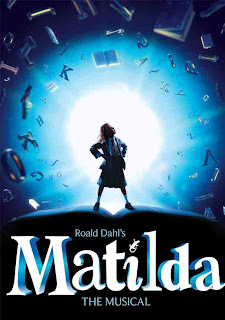 Matilda sings, in "Naughty,"
But how does Matilda stand up to her parents and Miss Trunchbull? At first, my youngest was sure that Miss Honey helped her. But as we talked about it, we realized that while Miss Honey was certainly kind, she didn't really help Matilda. Miss Honey sings about how she's too afraid to stand up for what's right. Matilda finds the courage within herself. The librarian, the wonderful Mrs. Phelps, certainly encourages Matilda to believe in herself and find courage in her stories. Like all Roald Dahl's heroes, Matilda's imagination sustains her when nothing else does. But I would argue that Matilda really survives on her own. Harry Potter, in contrast, succeeds through his own courage and determination, but only with the help of his friends. Much of the plot of the Harry Potter books revolves around the relationship between Harry, Ron and Hermione -- coming together, getting into fights, and then resolving them to fight the common enemy. This emphasis on group work reminds me of how much we ask children to work together on projects in school now. 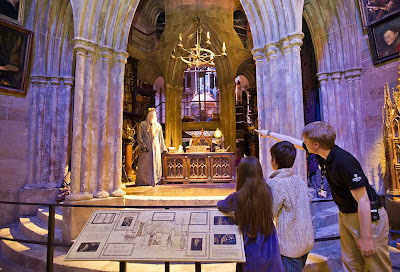 In a similar way, the Warner Brother's Harry Potter Studio Tour in Leavesden, emphasizes throughout just how many people are involved in producing these movies. You get a sense of the intricate detail and craftsmanship put in at all levels, from the props to the set design, from the costumes to the special effects, from the concept art to the scale models. It is a tremendous group effort. You also get a sense of the effort, time and skill put into each step - that the movie magic is far more work than magic. As I have thought about what it means to implement the Common Core State Standards, one of my real focuses is on how I can help children discover increasingly more complex nonfiction texts on subjects they are interested in. Five of us -- librarians and literacy experts -- are working together to show what the Common Core means for school libraries in real life. We’re calling the series Common Core IRL: In Real Libraries. Kids are fascinated by the world around them. Our role, as adults who share books with kids, is to help them discover books that build on this interest, making them want to learn more and more. But we need to do so with books that build on their knowledge in a gradual way. For our first topic, we chose to focus on frogs. Last month, each of us shared books on frogs that gradually increased in text complexity. We have pulled together our recommendations in one document, to share with teachers, librarians and parents. Please feel free to download this and share with your colleagues and friends. We look forward to making Common Core IRL a recurring feature. Are there topics that you think your students would be interested in that we should cover? Let us know in the comments. Roald Dahl is one of my all-time favorite authors. Reading his books aloud is a delicious treat, for grown-ups and kids alike. We have particularly loved listening to his audiobooks as a family. We loved, loved, loved Jeremy Irons reading James and the Giant Peach. And Dahl himself recorded many of his books - The Fantastic Mr. Fox was one of our favorites, as well. I've been so excited that more and more folks are talking about Matilda, with Matilda the Musical moving from London to New York this spring. Did you know that Matilda is turning 25 this year?! On one hand, I'm amazed -- but on the other hand, Dahl's stories have this timeless feel that makes them seem like they've been around forever. 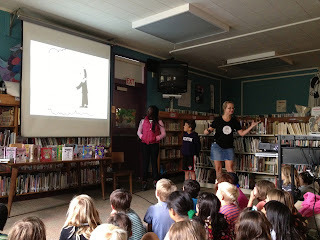 I was happy to help Penguin Young Readers Group celebrate this milestone, joining them in their epic 25-stop blog tour! Bloggers are sharing how they feel about Matilda - join us for a chance to win a Matilda prize pack at each and every stop! Mrs. Phelps looked along the shelves, taking her time. She didn’t quite know what to bring out. How, she asked herself, does one choose a famous grown-up book for a four-year-old girl? Her first thought was to pick a young teenager’s romance of the kind that is written for fifteen-year-old schoolgirls, but for some reason she found herself walking past that particular shelf. That’s the key, isn’t it? Teachers and librarians foster a love of books in students by introducing them to new books and helping them stretch their limits. Whether it's sharing a favorite classic or a brand new book, the key is helping kids find books that speak to them. As a school librarian, it's key that I know my students, their tastes and their reading levels. I know that Sam loves books about war - he'll devour anything about World War II, the Vietnam War, the Civil War. He's now my go-to guy to test out new historical fiction about soldiers, and he's thrilled with this new important job. It's also important to give kids the time to share books with one another - their recommendations carry even more weight than mine, in many cases. Each time a class comes in, I set out books that I've chosen just for them. As a parent, I need to keep telling myself how important it is that my child gets to choose their own books. I might really want my 3rd grader to read Matilda with me, but if she's dying to read the newest Dork Diaries then that's what she should read. I do talk about the importance of variety in our reading diet, especially with my older children who are committed readers. But with kids who are just developing the reading habit, it's crucial that most of their reading flies along without a struggle. This giveaway will run from June 12, 2013, at 12:01 PST until July 2, 2013, at 11:59 PST. No purchase necessary. You may enter once each day. Please pay it forward, sharing a book with a friend. Prizes courtesy of Penguin Young Readers Group. 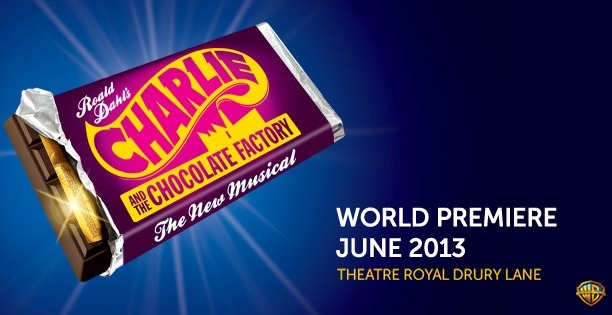 Be sure to visit the Official Matilda Facebook page to keep up with all things Matilda! 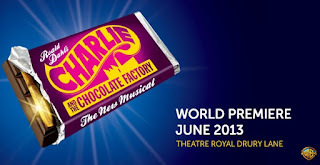 To find out more about Matilda the Musical on Broadway, visit their Facebook page! For the next stop on the Matilda 25th Anniversary blog tour, head to Bookish. The review copies were kindly sent by the publishers, Penguin Young Readers Group. If you make a purchase using the Amazon links on this site, a small portion goes to Great Kid Books (at no cost to you!). Thank you for your support. 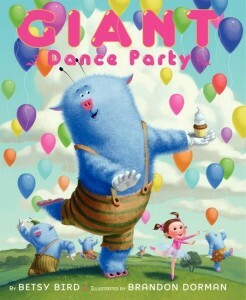 Giant Dance Party, by Betsy Bird and Brandon Dorman (ages 3-8) - snap-happy fun! There is something completely liberating about dancing -- letting your body move with the rhythm of the music, bopping along and feeling the beat pulse through you. And yet, there's something utterly terrifying about dancing in front of other people. Betsy Bird captures this crazy conflict with sheer delight in her debut picture book Giant Dance Party. If you're looking for a fun book to read aloud with your child or to a class, definitely seek this out. Lexy loves to dance. She loves dancing with her friends, in front of her stuffed animals, any type of dance. But there is one thing she cannot stand: dancing on stage in front of an expectant audience. "Every time she was sure her stage fright was gone, along came another recital, and blammo! Ice pop." Lexy's a determined kid, so she decides to turn her love of dance into a profession. She'll be a dance teacher - they never have to go on stage for a recital! As you can guess from the cover, Lexy's first students are a rowdy group of fuzzy, blue giants. You see, giants love to dance but they don't know how. Bird's text and Dorman's illustrations work like a charm with a group, especially when you're willing to put a little pep into your reading. When I let loose a little with our kindergartners, they loved it - bopping along with the story (floor dancing, the kindergarten version of car dancing, is totally allowed in the library!). My favorite was the chicken dance! The text is bouncy, easy to read aloud, and filled with all sorts of layers of humor for kids and adults. 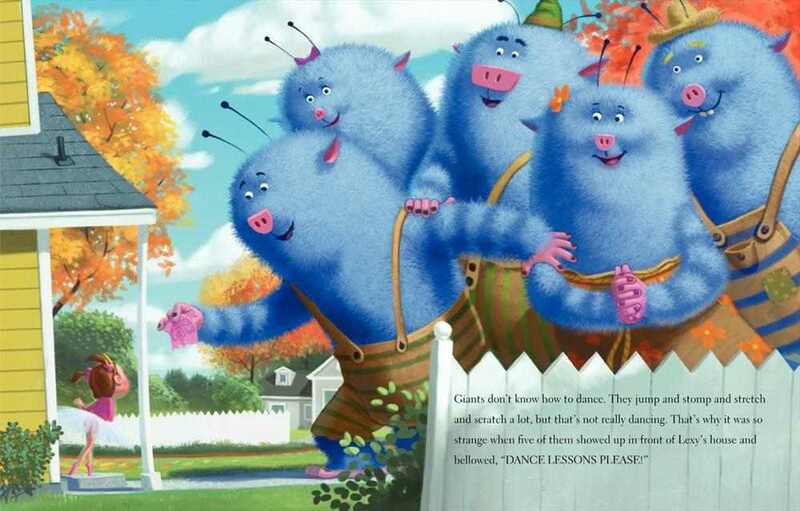 The digital illustrations have a cartoon feel that mirrors the energy and enthusiasm of kids, perfectly amplifying Lexy's crazy, silly world where giants show up to take dance lessons. And yet Dorman's use of colors and round figures keep the tone sweet instead of chaotic. "Do enough storytimes and you develop an ear for cadence. For rhythm and language. You see what subjects do and do not work. You figure out how much to say, and where to scale back." Want to have some fun and host your own giant dance party? Check out Betsy's fun guest post at HarperCollins Children’s Books School & Library Blog The Page Turn. Break out some cool blue food (blue ice pops, blue popcorn, and blueberry cupcakes). Add some music for little monsters. And of course, some idea for great costumes. It's not often that I review a book by a friend and colleague, but I thoroughly tested Giant Dance Party with kindergartners at Emerson. They gave it a unanimous, unprompted, huge-smiling approval. The review copies were kindly sent by the publishers, HarperCollins. If you make a purchase using the Amazon links on this site, a small portion goes to Great Kid Books (at no cost to you!). Thank you for your support. 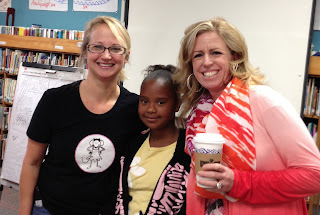 Emerson students were thrilled this week to meet the author of one of their favorite series. Jennifer L. Holm writes two fantastic series of graphic novels, Babymouse and Squish, both of which are illustrated by her brother Matt. Jenni shared great insights into how she and Matt make comics, encouraged kids and teachers to create their own stories, and answered great questions from the kids. Jenni took students back to the beginning, when she was a kid growing up with five brothers. She had our students giggling as they saw pictures of her and Matt as little kids. Their dad was a big comic book fan and they all read lots of comics - from Charlie Brown and Calvin & Hobbes, to superhero comics like Batman, Superman and Spiderman. One kid asked what inspired her to be a writer, and Jenni talked about how she loved to read as a kid. Even if they went to an amusement park, she always brought a book. Matt, on the other hand, was always a doodler. 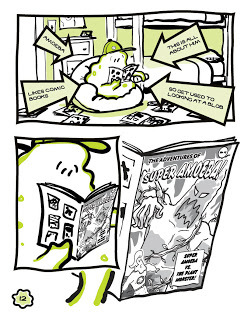 By the time he was in 5th grade, he wrote his own four panel comic about aliens. My students love the blend of fantasy and realistic humor in both Babymouse and Squish. They can relate to Babymouse's bad whisker days (I mean, who hasn't had a bad hair day?!) and trouble with mean girl Felicia Furrypaws. They connect to everyman Squish, the boy (I mean amoeba) next door. And they really like the way each story has a moral or message in it, with a satisfying ending. As Jenni got the kids to help her create a new scene for Babymouse (we loved the Ninja Babymouse and giggled at the WonderMouse! ), she helped the kids really see how revision works in real life. They saw that her first attempt didn't quite work and she talked about how long it takes to write and revise a comic book. She shared with us how she writes the storyboard with the action and dialog, and then Matt starts drawing the characters. It's a very interesting back-and-forth creative process. I was thrilled that many of our students in 3rd and 4th grade shared their love of Penny in Heaven, Turtle in Paradise and The Trouble with May Amelia, Jenni's historical fiction. Both come from her research into different sides of her family history. 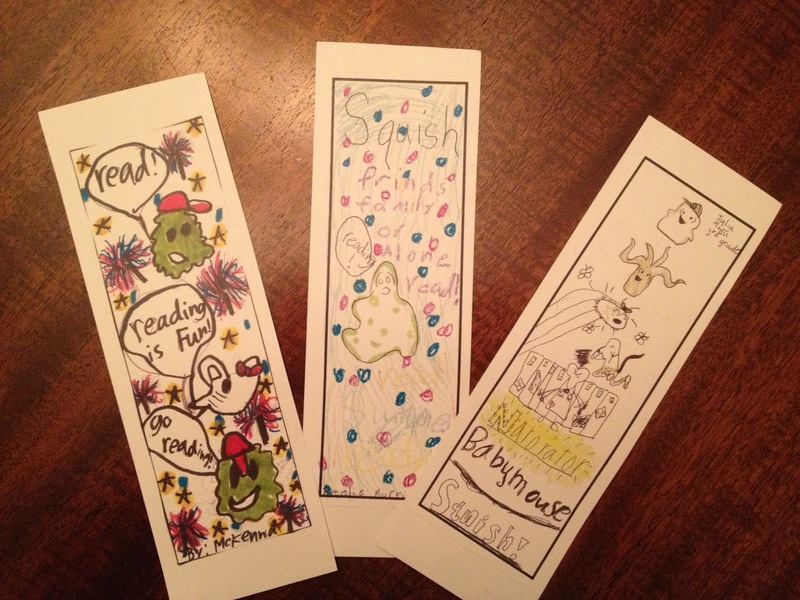 My students and I loved kicking off our summer reading drive this week with such a great visit. Jenni was funny, inspiring and a joy to have. We laughed, we celebrated our love of reading, we all squealed for Squish! Thank you!! OK, time for true confessions. I am gullible. I fall completely into stories and movies, gasping when something awful happens, and never figuring out the clues until the main character does. Yes, I even believed a classmate in 6th grade when they told me that "gullible" was not in the dictionary. You get the picture. But mysteries are deliciously fun to read. Even if I can never quite put all the clues together until it's too late and the main character is running for her life. It turns out -- reading mysteries is also really good for you. Mystery readers need to play close attention to the details as they read, but they also need to make predictions and think about how these clues fit together as a whole. Take a look here at Lucy Calkin's 3rd grade mystery unit and how two teachers made it work: Amber Polk and Wendy McElhinny. 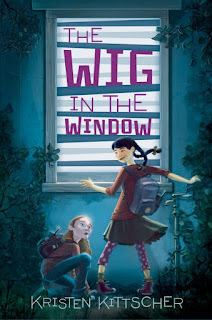 If you're looking for a fun new mystery for tweens, I had a lot of fun reading Kristen Kittscher's debut novel The Wig in the Window. It's a great mystery for kids who have moved on from Encyclopedia Brown and are ready for something longer. I'm excited to join the Wig in the Window tour in anticipation of its release on June 18th! Best friends Sophie and Grace have fun pretending to be spies as they conduct late night stakeouts in their southern California suburb. But things take an unexpected turn when they spy on Sophie's odd guidance counselor, Dr. Agford, and witness what the girls are sure is a bloody murder and call 911. But when the police discover that Dr. Agford was just chopping beets with a cleaver, the girls are in big trouble. Sophie takes full blame, since the police track the call to her phone call, and her parents are not happy. Sophie must endure frequent "counseling" sessions with Dr. Agford as well as do community service working in Dr. Agford's yard every Saturday. The suspense escalates as Sophie and Grace follow their suspicions that something is just not right with Dr. Agford, her wig, and her behavior. There are many twists and turns, both in their friendship and in the case, that will captivate tweens who love realistic stories and mysteries. Sophie's narrative is both appealing and a natural hook. Bay Area friends - if you know tweens who love a good mystery, will you email me? We're trying to plan a special event for kids this summer when Kristen Kittscher visits the Bay Area. Our plans are still under wraps, like all good mysteries!